On Friday 9th October 2009 at 7.30pm (NEW DATE!) 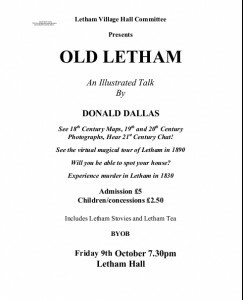 in Letham Village Hall there will be an ‘Old Letham Night‘ – an illustrated talk by local historian Donald Dallas and a chance to look at photos, maps and artefacts from the village’s past. This will be a ‘Bring Your Own Bottle’ event but stovies and tea are included! Don’t miss it!